GRAVES, THOMAS, 1st Baron GRAVES, naval officer and governor of Newfoundland; b. 23 Oct., 1725 in Thanckes, England, second of three sons of Captain Thomas Graves and his second wife, Elizabeth Budgell; m. 22 June 1771 in Ottery St Mary; England, Elizabeth Williams, daughter and co-heiress of William Peere Williams of Cadhay House, and they had two sons and three daughters; d. 9 Feb. 1802 at Cadhay House. Thomas Graves grew up in a seafaring family and first saw Newfoundland in the summer of 1739 or 1740 as a youthful volunteer in the squadron of Commodore Henry Medley, then governor of the island. 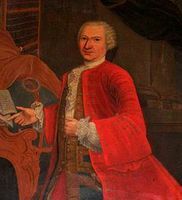 Soon afterwards he transferred to the Norfolk, commanded by his father, and in 1741 took part in the unsuccessful expedition against Cartagena (Colombia). On 25 June 1743 he was promoted lieutenant and posted to the 50-gun Romney. 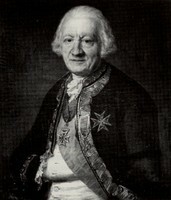 When peace came in 1748, he took up the systematic study of principles of gunnery and fortification and mastered the French language. Promoted captain in 1755, he commanded a number of warships in the early years of the Seven Years’ War. On 14 May 1761 the governor of Newfoundland, James Webb*, died unexpectedly just prior to setting out for his government. Graves received his commission as governor and commander-in-chief the following day, and sailed for Newfoundland on the 26th. He convoyed the annual fleet of West Country fishing ships safely across the Atlantic, arriving in St John’s on 1 July. After supervising the summer fishery and settling the usual disputes, he sailed for Europe in November with 66 merchant ships. Since he first escorted ships to the Portuguese market and then had to wait to convoy the trade from Portugal to England, Graves did not arrive back in Plymouth until 18 March 1762. He followed the same pattern throughout his three years as governor, but the following summers were not to be so uneventful. On his outward voyage in 1762 Graves received news from Captain Charles Douglas* of the Siren that four French warships had been seen approaching St John’s. When the governor made the Newfoundland coast near Cape Race early in July, he learned that St John’s had already fallen. He promptly reinforced the garrison on Bois Island in Ferryland harbour and then made his way through an iceberg-strewn sea to Placentia, the only other garrisoned centre remaining in British hands. There he made use of his engineering skills to repair the forts. In the summer of 1763, Captain John Ruthven reported from the treaty coast that the French were cutting down trees to build boats and erect warehouses, and were leaving boats behind after the end of the season. He was burning any he could lay his hands on, but asked for guidance. Graves in St John’s strove to provide a reasonable interpretation of the treaty terms, one which he hoped would be approved by the home authorities. He pointed out to Ruthven that the treaty limited the French to erecting only stages made of boards and huts necessary for fishing and drying fish, and he ordered him to destroy all other buildings with their contents after giving due notice. Boats built of Newfoundland timber should also be destroyed, but boats brought from France, even if left during the winter, should not. Ships continuing to fish after the season was over should be driven off the coast, again after proper notice was given. Above all, both British and French fishers must recognize British sovereignty over the coast and the authority of the governor and his surrogates to settle all disputes. By the time that Graves returned to England in March 1764 the French ambassador had lodged “heavy complaints” about the actions of his captains on the treaty coast, especially in compelling French fishers to leave by 10 September. Graves in reply defended the September date as “the custom of the country” and taxed the French with simply making excuses in order to remain over the winter to trap furs, fell timber, and build boats, and with living in what were almost “little French towns.” The Admiralty in May 1764 reprimanded Ruthven for the “violence and temerity” of his actions, and Graves’s successor, Hugh Palliser, was instructed to prevent British fishermen and his own officers from interrupting the French fishery in future. 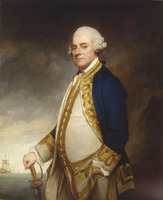 At the same time the Admiralty assured Graves that it was “perfectly well satisfied with his conduct at Newfoundland.” Indeed it was due in large part to Graves’s resolute policies that the British government was able to reject completely a French claim for an exclusive fishery on the treaty coast. 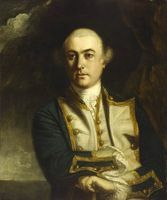 In December 1764 Graves was appointed to command a squadron dispatched to investigate merchants’ complaints against the governors of British forts on the west coast of Africa. On his return he commanded a succession of warships, mostly in home waters. He sat briefly in parliament in 1775 as member for East Looe in Cornwall, but neither spoke nor voted. The American revolution brought Graves to active service once more. 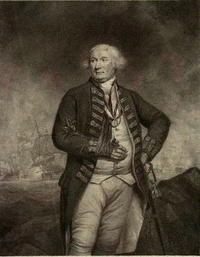 In 1779 he served in Vice-Admiral John Byron*’s fleet in the West Indies, in 1780 he was in the Channel fleet commanded by Sir Charles Hardy*, and in July 1781 he succeeded Mariot Arbuthnot* as commander-in-chief of the North American squadron. In September he failed to break the French naval blockade of the British army at Yorktown, Va, and its surrender followed in October. Inevitably, Graves was criticized, but the French fleet was superior and probably only a commander of Nelsonian talents could have dislodged it. Upon leaving the North American command in November, Graves went to the West Indies. After the battle of the Saintes he sailed for England in July 1782 in charge of a motley squadron composed mainly of prizes. Many sank in a storm, and his flagship the Ramillies had to be destroyed after sustaining heavy damage. Graves was promoted vice-admiral of the blue in September 1787 and soon after became commander-in chief at Plymouth. 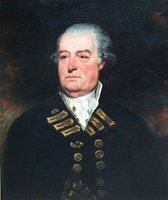 On the outbreak of war with France in 1793 he was appointed second in command of the Channel fleet under Lord Howe and the next year advanced to full admiral. In the Royal Sovereign he defeated three enemy ships of the line in the battle of the “Glorious First of June,” 1794, and was rewarded with an Irish peerage. However, the battle marked the end of his long sea career; badly wounded in the right arm, he was forced to retire to his estate in Devon. James Northcote painted his portrait and Francesco Bartolozzi engraved his likeness against a background depicting the great naval victory. Thomas Graves is one of the most interesting of the early governors of Newfoundland and held the office at a critical time in the island’s development. His personality comes through in his correspondence since he did not hesitate to express himself candidly, even on personal matters. The Newfoundland command, with its absence of prize money and the endless involvement in fishing disputes, cannot have been attractive to him. Nevertheless, the Newfoundland historian, Daniel Woodley Prowse*, praises “the cool, methodical way in which he sets to work to defend the Colony, his admirable arrangements, his lucid judgments, his entire freedom from the bigotry of the age.” Whether or not he liked Newfoundland, he brought to his task a professionalism and sound judgement that made him a successful governor. National Maritime Museum, GRV/101–20. PANL, GN 2/1, 3. PRO, ADM 1/482, 1/1835–36, 1/4126; ADM 2/88, 2/90, 2/535–37; ADM 51/50; CO 194/15, 194/26; CO 195/9 (mfm. at PAC); PROB 11/1378/546. “Biographical memoir of the right hon. 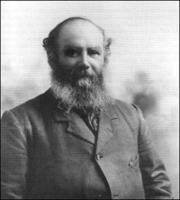 Thomas Lord Graves . . . ,” Naval Chronicle, 5 (January–June 1801): 377–408. “Some account of Admiral Lord Graves,” European Magazine, and London Rev. (London), 28 (July–December 1795): 147–56. John Charnock, Biographia navalis,; or, impartial memoirs of the lives and characters of officers of the navy of Great Britain, from the year 1660 to the present time . . . (6v., London, 1794–98), 6: 126–43. DNB. Prowse, Hist. of Nfld. William H. Whiteley, “GRAVES, THOMAS, 1st Baron GRAVES,” in Dictionary of Canadian Biography, vol. 5, University of Toronto/Université Laval, 2003–, accessed April 26, 2019, http://www.biographi.ca/en/bio/graves_thomas_5E.html.